Teeth are directly damaged from the consumption of acidic foods. When a person eats acidic foods, tooth enamel becomes damaged, leading to erosion. When combined with sugar, this can also lead to decay. The over-consumption of acidic foods is becoming quite an epidemic, with as many as 60% of children showing evidence of tooth erosion, according to the British Dental Association. The reason why acidic foods are so harmful is their pH level, which causes tooth enamel to wear away. As a result, affected teeth begin to discolour, teeth begin to weaken, and tooth sensitivity becomes a real issue over time. Demineralisation will also occur – which can eventually lead to tooth decay. Ultimately, it’s a good idea to avoid acidic foods where possible, but this isn’t always an option. 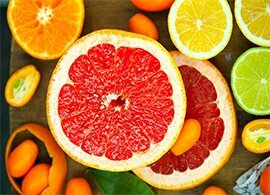 Plus, some acidic foods offer many health benefits – so eat them in moderation rather than cut them completely out of your diet. Popular combinations include fruit and nuts, juice and yoghurt, and wine and cheese. These perfect pairings neutralise acidity and promote remineralisation of tooth enamel. After eating or drinking acidic foods or drinks, enamel becomes softened. While it’s a good idea to brush your teeth after a meal, brushing too soon will only speed up the process of acid attack as you brush and damage your acid-coated teeth. Instead, have plenty of water to drink after your meal and consider chewing sugar-free gum. Both of these activities will produce saliva, which will cleanse your mouth. Thirty or so minutes after a meal you can think about brushing your teeth. For more information about acid erosion, or to get your teeth checked over, book an appointment to see your AP Smilecare dentist today. We’ll be able to assess the current state of your teeth and give you some tips on how to improve and enhance your oral health.